North Dakota Traffic Deaths Declined to Lowest in a Decade | Larson Law Firm P.C. The North Dakota Department of Transportation has released its preliminary traffic fatality numbers for 2018; there were 104 traffic deaths, a ten percent decrease from the previous year and the lowest number since 2008. Transportation Director Tom Sorel was quoted in a story on Valley News Live as saying that officials are encouraged to see traffic deaths down from the previous year, but that the state needs to continue working toward its Vision Zero goal of zero traffic fatalities and zero serious injuries. The reduced number of fatal car accidents is excellent news. The bad news is that most of those 104 deaths were preventable. Lack of seat belts, drunk driving and speeding continue to contribute to fatal traffic crashes in North Dakota, according to traffic safety officials. Impaired driving. This can include drunk driving or drugged driving. In either case, the presence of alcohol or drugs in the driver’s system increases the odds that they will cause a crash that could injure or kill other innocent parties. Per the North Dakota Department of Transportation (NDDOT), 47% of traffic fatalities in 2017 were alcohol-related. When a driver gets behind the wheel after having had too much to drink or having taken drugs they are behaving negligently. Speeding, which is either driving too fast for the current road conditions or exceeding the speed limit is another example of negligent driver behavior that can lead to an accident. Accidents caused by a speeding vehicle tend to have much more serious injuries and property damage. Twenty-four percent of traffic fatalities in ND in 2017 were speed-related, per the NDDOT, slightly lower than the national average. Not wearing a seat belt. The NDDOT and federal safety officials agree that seat belts save lives. The National Safety Council reports that, “seat belts are the single most effective safety device to prevent death and injury in a motor vehicle crash.” In North Dakota in 2017, every 7 days an unbelted vehicle occupant died, and every 11 days one person without a seat belt was ejected from a vehicle. Of all the traffic fatalities that year, 55% of the victims were not wearing seat belts. 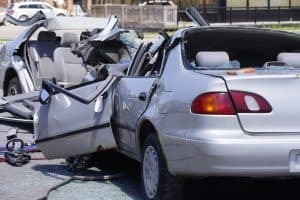 Losing a loved one in a traffic accident often feels even more tragic because in most cases the accident could have been prevented if not for the negligence of the driver who caused the crash. An experienced North Dakota car accident attorney from the Larson Law Firm P.C. is here to help our clients obtain justice in the form of a wrongful death claim for the loss of a loved one that was caused by the reckless or negligent actions of another driver. 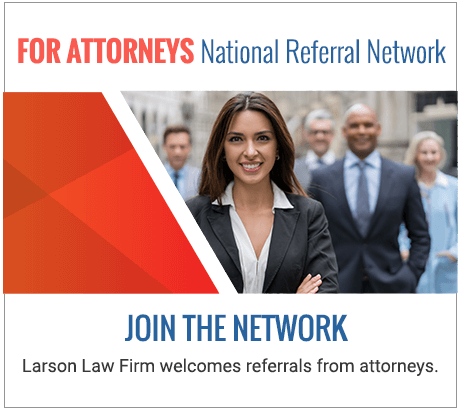 The North Dakota car accident lawyers of Larson Law Firm P.C. are here to fight for those injured in car accidents. We investigate your accident and determine who’s responsible for your injuries. For experienced help, please call our Minot office at 701-484-HURT or use our contact form to schedule a free consultation today.